Warsaw became the capital of Poland in 1596, the city flanks both side of the Vistula River, two thirds of the city’s area lying on the west bank and one third on the east. Jews lived in Warsaw from the 15th century, in the 19th century Warsaw’s Jewish population grew rapidly, becoming the largest Jewish community in Europe, and by the 20th century the second largest in the World, behind New York. Jews were to be found in every part of the city, but predominantly in the Northern part, with many apartment houses and certain streets inhabited exclusively by Jews. In 1935 the city limits covered an area of 54 square miles with a population of 1.3 million people. On the eve of WW2 the Jewish population in Warsaw numbered 337,000, about 29% of the total population of the city, this figure rose to 445,000 by March 1941. 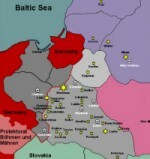 Early September 1939 following the German invasion of Poland on 31 August 1939, the German forces reached the southern and western parts of the city on 8 and 9 September 1939. Within a few days they had surrounded the city from all sides, Warsaw bravely stood up to the German siege for 3 weeks, with air attacks and artillery shelling causing heavy damage and significant loss of life. As a result of the constant bombardments from the air and by artillery fire, there was a great exodus from the city. Warsaw’s mayor Stefan Starzynski appointed Adam Czerniakow as Chairman of the Jewish Council on 23 September 1939. From the first days of the occupation the Jews were subjected to attacks and discrimination, such as being driven from food lines, seized for forced labour and assaults on religious Jews wearing their traditional garbs. Teachers, craftsman, professionals, members of welfare and cultural institutions lost their positions, without any compensation, with little or no prospect of obtaining similar positions. 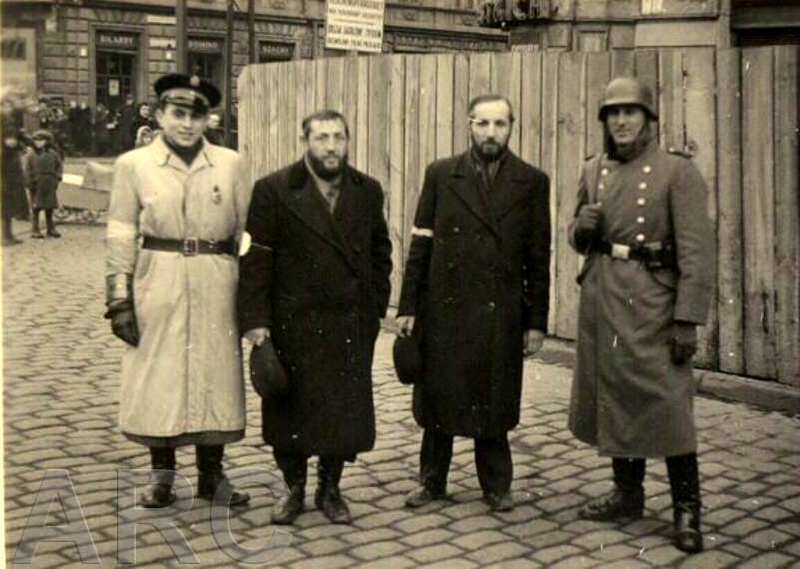 In November 1939 the first anti-Jewish decree’s were issued, such as the introduction of the white armband with a blue Star of David on it to be worn by all men, women and Jews over 10 years of age, from 1 December 1939, the requirement of signs identifying Jewish shops and enterprises and a ban on train travels. Radios were also confiscated from Jews and Poles. The harshest measures came with a number of decrees on economic affairs, such as the prohibition of non-Jews buying or leasing Jewish enterprises without obtaining a special permit for this purpose, decreed by District Governor Ludwig Fischer on 17 October 1939. In November 1939 more decrees followed concerning the handling of money by Jews. Jews were ordered to deposit their money in a blocked bank account. The banks could release no more than 250 zloties per week to the holder of the account. These orders made it impossible for Jews to carry on economic activity in the open, and particularly outside of Jewish circles. In addition to blocking Jewish accounts and putting a stop to economic activity, the Germans also embarked upon the confiscation of Jewish enterprises, excluding small stores in the Jewish area. Jewish managers and staff were often removed, only being retained, if it suited the new owners. Even in the early stages of the occupation the assets, accumulated in the past, served the Jews as their main source of subsistence. Jews with savings or goods that they had managed to conceal began trading them for food - a practice that was to continue throughout the war. As time went on the Jews’ property and resources dwindled, and more and more Jews became penniless and faced a slow death, owing to the lack of food and other basic requirements they needed to exist. In place of the many institutions that had existed pre-war, only two frameworks were allowed to function under the occupying power: the Judenrat and Welfare Institutions. The Judenrat was a new body, set up by the Germans, in place of the traditional Jewish Community Council. On 4 October 1939 Adam Czerniakow was taken to the Gestapo and Police Headquarters on Aleja Szucha, where he was told to appoint 24 persons to the Community Council and become its chairman. The Judenrat headquarters was on Grzybowska Street and amongst the leading men that worked there were: Jaszunski, Sztoclcman, Milejkowski, Lichtenbaum, Zabludowski, Kobryner, Zundelewicz, Rozensztat, Kupczyker, Zygielbojm, Sztokhamer, Dr. Szoszkies, and Gepner. The Judenrat was the sole official body that the German authorities dealt with, thus facilitating the stranglehold the occupying powers had over the Jews. The complete Judenrat staff at its height numbered 6,000 persons. Before long it became evident that the number of needy cases was growing and that an organisation had to be created and equipped that would be able to meet the requirements of the entire Jewish population. The American Joint Distribution Committee sponsored ZTOS (Jewish Mutual Aid Society) lent assistance to 250,000 Jews during the Passover of 1940. Its most important means of aiding masses of people were its soup kitchens, which doled out a bowl of soup and a piece of bread to all comers. When this operation was at its height, more than one hundred such soup kitchens were in operation in Jewish Warsaw. In March 1940 a wave of muggings and attacks on Jews was launched by Polish gangs. Individual Jews were robbed in the streets without any interference by bystanders. During the Easter season these attacks turned into a real pogrom, which continued for eight days, and only ended when the German authorities ordered it to stop. The first attempt to set up a ghetto had been made by the SS in November 1939, but at the time the military governor General Karl Ulrich von Neumann-Neurode, put a stop to the plan. In February 1940, however, Waldemar Schön, the official in charge of evacuation and relocation in the German District Administration, was ordered to up plans for the establishment of a ghetto. Various possibilities were considered, one of them being the removal form the city to the Praga suburbs. On 12 October 1940, The Day of Atonement, the Jews were informed of the decree establishing a ghetto. A few days later a map was published indicating the streets assigned to the ghetto area. 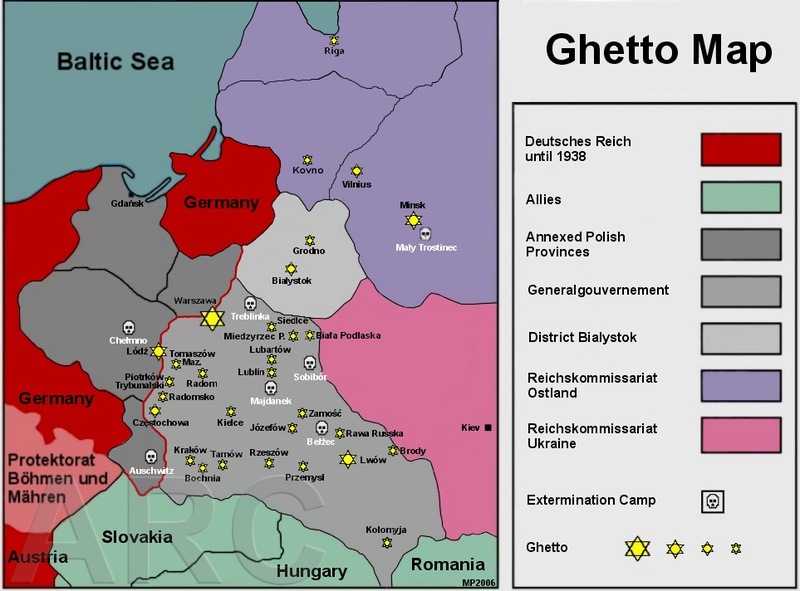 The creation of the ghetto meant that 113,000 Poles had to vacate their homes, and for 138,000 Jews to take their place. Some 30% of the population of Warsaw was packed into 2.4% of the city’s area. 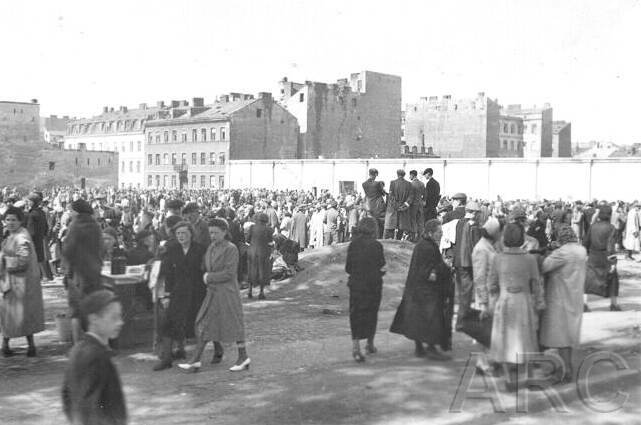 In mid-November 1940 the Jewish ghetto in Warsaw was sealed off by a high wall. Its construction took many months to complete. The work was carried out by the construction firm Schmidt & Münstermann, based on 8/3 Mars Street, which later helped building the Treblinka death camp. The ghetto wall was 3.5 m high, topped by glass and barbed wire. The Nazis did not use the term ghetto, but referred to the area as Jüdischer Wohnbezirk (Jewish Quarter). A Jüdischer Ordnungsdienst ("Jewish Order Service" / Jewish police force) was established and at its height, numbered 2,000 members. The leader of the Jüdischer Ordnungsdienst was Josef Szerynski, a Polish police colonel who had converted to Christianity. He changed his name from Szenkman and developed an anti-Semitic attitude. After his arrest in May 1942, Jakob Lejkin, his deputy, took over temporary command of the Jüdischer Ordnungsdienst. This organization played a significant role in the "Great Deportation Action" in the summer of 1942. The daily food rations, allocated to the Warsaw Jews, consisted of 181 calories - about 25% of the rations for non-Jewish Poles, and only 8% of the nutritional value of the food that the Germans received for their official ration coupons. 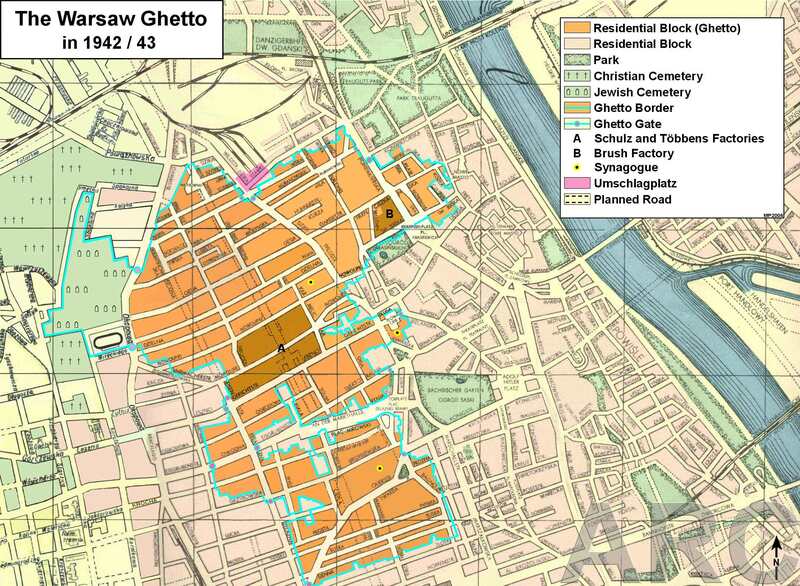 In November 1940 the ghetto was sealed off. There were already 445 deaths in the ghetto. 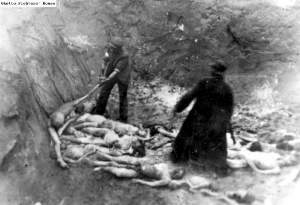 The death toll thereafter rose rapidly: in January 1941 to 898, in April to 2,061, in June to 4,290 and in August to 5,560. Then the monthly figure fluctuated between 4,000-5,000 for as long as the ghetto existed. The ghetto’s ties with the outside world were handled by the Transferstelle, a German authority that was in charge of the traffic of goods, both into and out of the ghetto. The first official in charge of this office was Alexander Palfinger, finally succeeded by a certain Bischof. In May 1941 a Berlin attorney, named Heinz Auerswald, was appointed Kommissar of the Jewish quarter on behalf of the German authorities. Auerswald's appointment over the Jewish quarter was parallel to that of Ludwig Leist, who was the commander of the entire city. Czerniakow similarly became the head of the quarter. Auerswald's office also assumed control of the Transferstelle and managed the Jewish affairs. Of course the police and SS continued to intervene in its work. 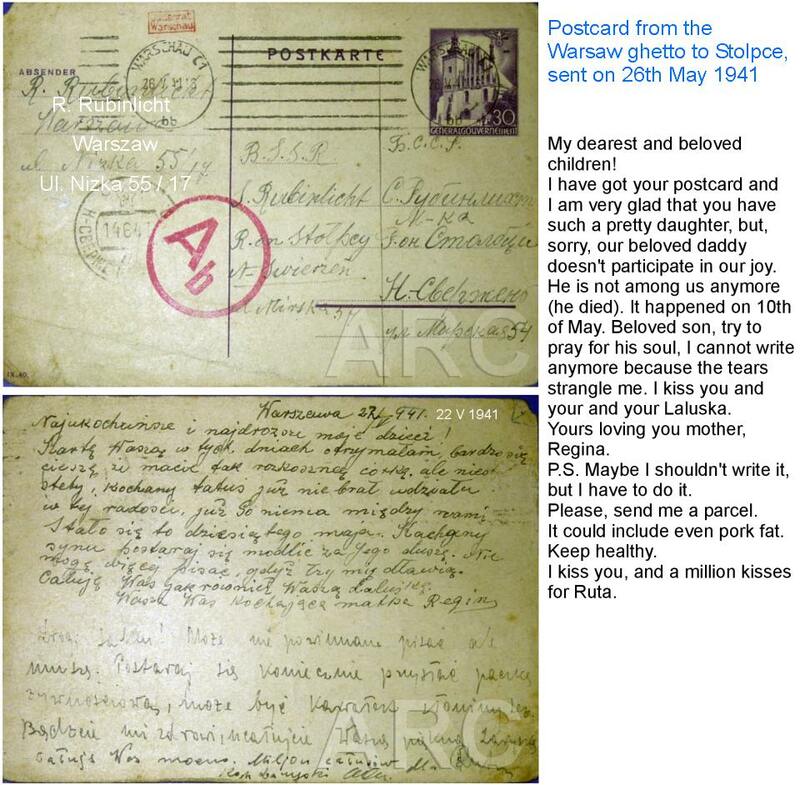 In the summer of 1941, some 11,300 were sent to labour camps in Warsaw, Lublin and Krakow, where they were forced to do back-breaking work, suffering from hunger, poor sanitary conditions and harsh discipline. 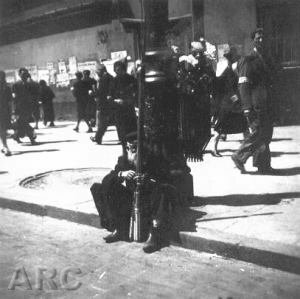 Another focal point of authority and power in the Warsaw ghetto was an agency known as the "13", which took its name from the address of its headquarters on Leszno Street. The "13" network was closely identified with the name of its founder and moving spirit, Abraham Gancwajch and the group of men of his environment. Gancwajch and most of his senior aides were not even veteran residents of Warsaw but had come to the city as refugees. The principal division of the "13" network (founded in December 1940) was the "Office to Combat Usury and Profiteering in the Jewish Quarter of Warsaw", and a supervisory unit. The 300-400 men of "13" wore polished boots, caps with a green band (regular police wore blue) and epaulets and stars to denote their ranks. Their rise to power in the ghetto was due to the sanction they received from key figures in the occupation regime, particularly the SD (Sicherheitsdienst / Security Service). They were simply collaborators. In May 1941 Gancwajch’s agency set up "First Aid", a kind of Red Cross emergency station. Gancwajch also inspired the establishment of a department to supervise weights and measures in the ghetto, an organisation of disabled veterans of the 1939 fighting, and cultural and religious societies. During a certain period, two refugees from Lodz, Kohn and Heller were counted among Gancwajch’s associates. In time they broke with him and began operating on their own, but they did not give up their German patronage and found protectors among the Gestapo men. Kohn and Heller built up various commercial operations, one being the horse-drawn wooden trolleys that transported passengers in the ghetto. Kohn and Heller maintained their power longer than Gancwajch and his men. In July 1941 Auerswald closed down Gancwajch’s principal bastion of power, the "Office to Combat Usury and Profiteering". It is impossible to pinpoint the exact cause of Gancwajch defeat in his contest with the Judenrat. Gancwajch's fate is not known. German manufacturers appeared in the ghetto in the summer of 1941, having been granted authorisation to operate in the Warsaw area. First to appear on the scene, in July 1941, was Bernard Hallmann, owner of a carpentry company. 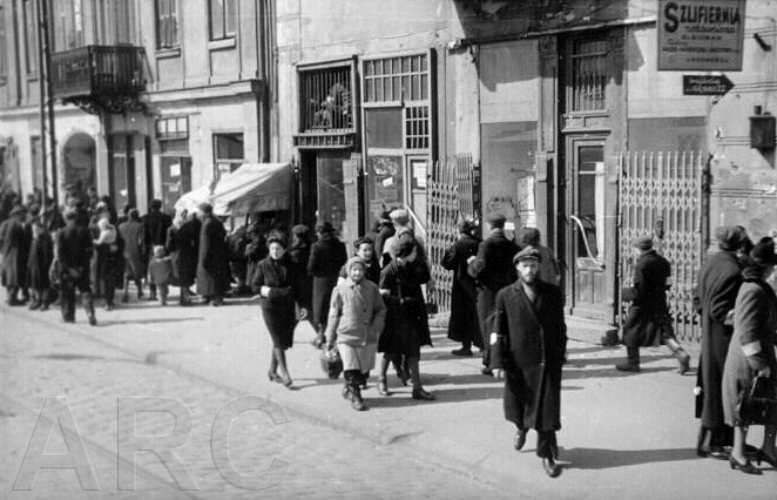 In September 1941, the Fritz Schulz Company, a Gdansk-based fur establishment, became active in the ghetto. The most important among these business men was Walther Többens, a manufacturer of textile goods, who began his activities in autumn. At first the German companies placed orders with existing Jewish workshops, but before long they put up their own workshops in the ghetto. Several methods were employed to carry out the smuggling operations: through buildings that were connected with buildings on the "Aryan" side, across the wall, through camouflaged openings in the wall and through underground canals. Smuggling on a larger scale also took place at the ghetto gates. Policemen, guards, Germans, Poles and Jews were involved, bribery was the order of the day. Children and women were also engaged on a smaller scale, risking their lives too. Every day smugglers were caught, paying the ultimate sacrifice. 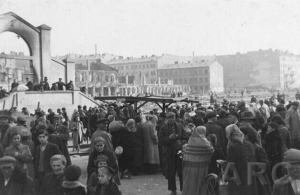 According to Czneriakow the necessary food, smuggled into the ghetto, represented 80% of all the products brought in. Self-help grew out of necessity to survive because the German ghetto policy regarding the distribution of food aimed at starvation on a massive scale. A Polish source calculated that the daily calorific content of food, officially distributed to national groups in 1941, was as follows: Germans 2,613 calories, Poles 699 calories, Jews only 184 calories. The nutritional value of the official Jewish rations was 15% of the minimum daily requirement for survival. In December 1941, Czerniakow estimated that there were about 10,000 ghetto inhabitants with capital, 250,000 who could support themselves, and 150,000 who were destitute. Only by selling all goods most of the inhabitants could survive. The critical problem was keeping the impoverished 150,000 Jews from malnutrition. Until the entry of the United States into the war in December 1941, the prime source of funding for aid to the ghetto was the "American-Jewish Joint Distribution Committee", known familiarly as the "The Joint". Its monetary resource gradually dwindled. Men such as Yitzhak Gitterman and Emanuel Ringelblum organised and led a variety of self-help agencies. Among these were "ZTOS", the "Jewish Mutual Aid Society", which operated over one hundred soup kitchens in Warsaw; and "Centos", the "National Society for the Care of Orphans", which ran schools and provided food, clothing and shelter. These self-help organisations employed hundreds of people, offering a daily bowl of soup as salary. They operated independently, besides the Judenrat. In January 1942, as the financial support from the "Joint" began to decline, the self-help organisations ceased relying upon voluntary donations and instead were empowered to impose taxes. Amongst the most important elements of self-help were the "house committees", which functioned in almost every apartment house. They imposed a double monthly payment on the residents, one for the benefit of self-help, the other for the needs of the apartment house itself. They collected food from every family that was able to make a contribution, and distributed the food to starving families. A person, carrying a bucket, went from apartment to apartment, collecting food, goods and clothing from the more fortunate who donated whatever they could spare. The house committees also assessed everybody’s resources and imposed a monthly payment upon each household. Money and goods were given to the central fund, which supported the soup kitchens. To enforce its effectiveness, the house committees used the only weapon available to them, shaming those who were selfish. Families who were able to make a contribution but refused to do so, found their names displayed at the entrance to their apartment building. 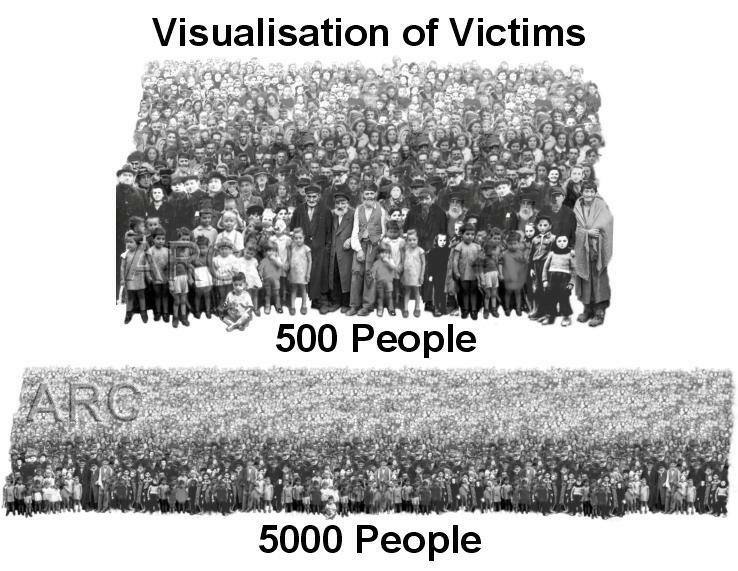 However, despite of all efforts, 5,000 ghetto people died every month in early 1942, most of them by starvation. The Germans tried to ban private and public prayer services, but the Jews continued with daily services in private homes. In spring of 1941, the ban was abolished and the synagogues were permitted to re-open. 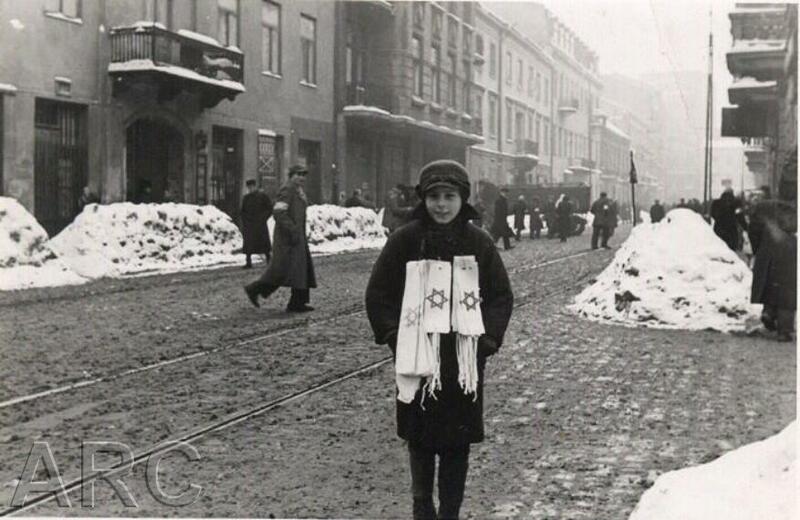 The Great Synagogue on Tlomacki Street was re-opened in June 1941, in a festive ceremony. Rabbi Kalonymos Kalmisch Shapira, the Hasidic rabbi of Piaseczno, maintained his flock of followers in the ghetto and preached to them on Sabbath. School instruction was prohibited in the ghetto. From time to time Czerniakow asked the German authorities for permission to re-open the schools. In 1941 permission was granted to open the school year for several elementary-school classes. This regular school year, the only one that was observed in the ghetto, started in October 1941. While regular schools were banned in the ghetto, the Judenrat was permitted to maintain the vocational training schools, sponsored by the "ORT" organization. The first training courses were opened in 1940, but they reached their maximum development after the ghetto was established. In mid-1941 2,454 students were attending such courses. Cultural life in the ghetto consisted of activities, conducted by the underground organisations. The "Idische Kultur Organizacje" (IKOR), a clandestine organisation for promoting Yiddish culture, in which Emanuel Ringelblum and Menahem Linder were active, sponsored literary evenings and special meetings to mark the anniversaries of noted Jewish writers. Clandestine libraries circulated officially banned books. An eighty-member symphony orchestra offered a repertoire of famous German composers. Artworks of Jewish composers were not allowed. Well known writers and poets continued to work in the ghetto: Itzhak Katzenelson, Israel Sztern, Jehoszua Perle, Hillel Zeitlin, Peretz Opoczynski, and Kalman Lis. Theatrical groups gave performances, well-known actors such as Michael Znicz, Zigmunt Turkow or Diana Blumenfeld appeared on stage. The audience mostly consisted of nouveaux riches, who preferred light entertainment to forget the horrors of daily life. 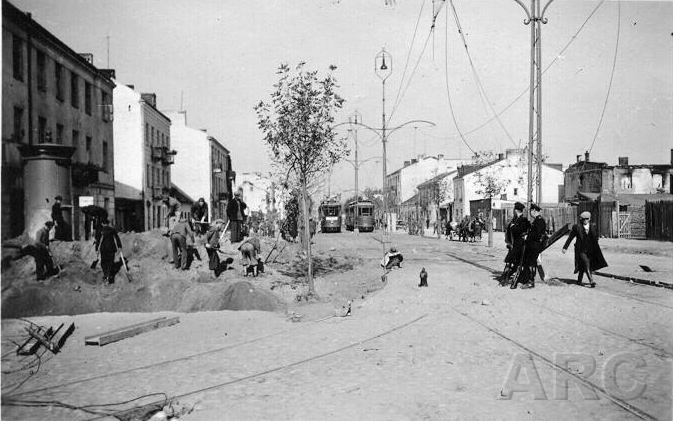 Underground activities by political circles and organisations had already begun when the Germans entered Warsaw. Members of youth movements and parties joined together and began preparing plans of resistance. At an early stage, the question arose as to whether political organisations could confine themselves to material aid and abandon political activity. At clandestine meetings in the soup kitchens, open discussions and debates were held and the different political positions were probed. The next step was to establish an underground press and to persist in efforts to communicate with political elements outside the country. At first the Germans displayed a lack of interest in the underground activities. Therefore the underground was enabled, prior to spring of 1942, to engage in a broad range of activities. The underground press achieved the aims of providing the news-hungry ghetto population with reliable informations about international political developments, and on the progress of war. It also raised political and ideological issues that encouraged polemics and discussions. Especially prominent were the "Bund" and the socialist Zionists "Po’alei Zion Z.S.". A unique and important enterprise, created in the ghetto, was the Ringelblum archive, code-named "ONEG SHABBAT". While it was not directly initiated by the political bodies, the archive depended on the support of public leaders and the underground organisations. The extant material, collected by the Ringelblum archive, consists of tens of thousands of pages: documents, notes, diaries, and a rich collection of underground newspapers. It is the most important source collection for research on the fate of Jews under the Nazi occupation of Warsaw and Poland in general. Jewish youth movements and their leaders played an important role in the underground, especially in the later stages, following the great deportations. During the war and in the ghetto the activities of the youth movements and their relarive power underwent a gradual change. They manifested a greater aptitude than other movements for changing circumstances and for taking dynamic action when necessary. The youth leaders Mordecai Anielewicz, Yitzhak Zuckerman, Zivia Lubetkin, Chaim Kaplan, and Israel Geller developed into acknowleged underground leaders because of their political instincts and leadership qualities. The youth movements did not confine their activities to Warsaw. They extended their work to cover the undertakings of the different movement branches and cells in all ghettos and Jewish communities in occupied Poland. These young people under false identities provided the link to isolated ghettos, cut off from the the world. 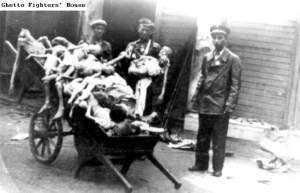 A drastic change happened in the relationship between the underground and the power structures in the ghetto when first reports came in about massacres at Ponary and other killing sites in eastern Europe. At this point a new concept arose - that the Germans had embarked upon the total destruction of the Jews and that therefore the Jews had no choice other than to stand up and fight, even if this offered no prospect of survival. In March 1942, at a meeting of the Warsaw Jewish leaders, Yitzhak Zuckerman, on behalf of the youth movements, sought to win agreement for creating an overall defence organisation. His proposal was turned down, regarded as too pessimistic. This failure led to the establishment of the "Antifascist Bloc", sponsored by the Communists and the "Zionist Left". This organization existed during March and April 1942, its military branch had 500 armed members. The plan of escaping to the forests and take up the fight from there, was not realized, expected weapons did not arrive... Just before the target date (in May 1942), the whole structure collapsed. The Communist leaders of the "Bloc" were imprisoned and the organization went out of existence. Special thanks to Barbara Engelking.